Last week, I was tinkering with the homing missile. I didn't like the way it behaved. The problem was the turning radius. A larger radius would make it very difficult to hit the target, since the missile couldn't turn quickly enough. A smaller radius helped, but looked boring, because the missile would turn sharply in the beginning, then fly in a mostly straight line. Having the missile flying along a straight line also makes impossible to fire around corners. The simple solution was to adjust the turning radius depending on the distance to the target. At a long distance, the missile will fly along a smooth arc. When it comes closer it will gradually turn quicker, following the target even through tight turns. The shock wave of the explosion will throw all nearby cars around, making this weapon even more useful. Together with a massive sound effect, camera shake, particle effects for the smoke trail and explosion, firing the homing missile really gives you a sense of power. 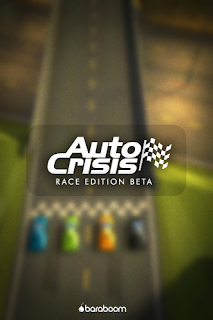 We're very excited about the look and feel in Auto Crisis. We've been spending a lot of time tweaking everything, and we're getting closer to perfection. 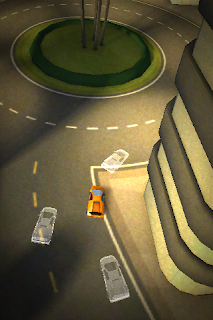 The camera follows the car like a hot air balloon in a rubber band. Looks very nice. 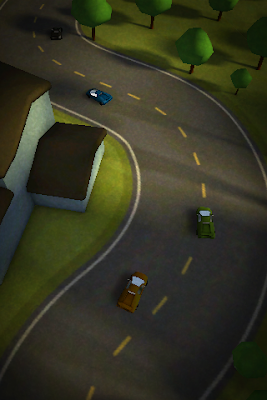 Cars are made a bit larger to add to the cartoonish look. The film grain and vignette makes a huge difference for a movie feeling. The theme music by our composer Tony Palm is great! Listen to a cut down version here. 1. 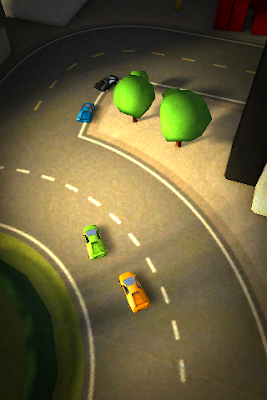 Work your way to the top by beating the better AI opponents in each race. You will be able to use their cars and face even better opponents. 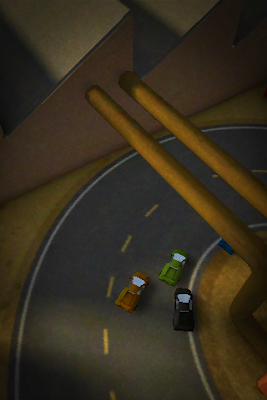 Pick up powerups to shoot them down while you're racing. 2. Single player time attack. Best result can be stored online. 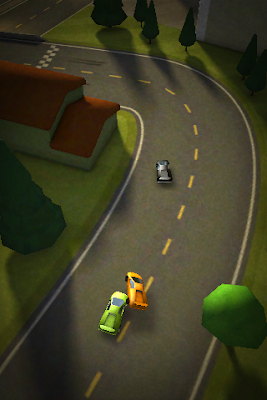 It means that as you're playing, you'll see ghost cars showing your personal best, and results from other players. Here are screenshots of the ghost drivers. What do you think? 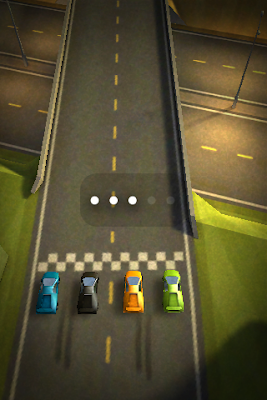 Update on our upcoming racing iPhone game Auto Crisis: We finally have the AI opponents working in an acceptable manner. The have a pretty nice pathfinding combined with basic obstacle avoidance. This means we actually have some engaging gameplay! 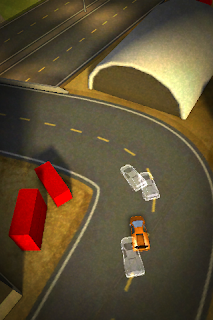 Unfortunately, the AI sometimes get stuck trying to drive though a wall. Kind of embarrassing... After some conferencing, we decided to just detect "stuck" AI:s and move them back on track as soon as they are outside the screen. Stupid fix, but so what? It works. After literally spending hours of frustration trying to make Ad Hoc distribution work for my iPhone game, I realized that my problem was Dropbox. Appearantly, some of the data in the app bundle was mangled in the transfer, making it crash when loading. Now don't missunderstand me; Dropbox is a great tool for sharing files when telecommuting or just syncing several computers. Here at Baraboom, we use it all the time. The simple solution was to zip the app before transferring it, and everything worked just fine. What? Yes I do enjoy painting faces on coorporate logotypes. The files you just saved are gone and can't be restored or found anywhere. Please prove us wrong. Not good anyway!